Jacob’s Ladder is a terrific example of what can happen when an inspired screenplay gets into the hands of a great director and a capable leading actor. I’m talking about Bruce Joel Rubin (Ghost), Adrian Lyne (Fatal Attraction), and Tim Robbins (Shawshank Redemption), respectively. Rubin’s script is a fever dream of a tale, following a New York Vietnam vet who’s losing his grip on reality. He’s seeing demonic faces in the subways and shadows, and after two members of his platoon die in car explosions, he’s convinced there’s a conspiracy to keep him from learning what actually happened his last day in ‘nam. Is he dead? Is he in purgatory? Is he hallucinating? Is he insane? The film is gloriously ambiguous right up until the end. Tim Robbins gives his first great performance in this movie. He shows considerable range in a part that calls for him to be terrified, emotionally devastated, paranoid, funny, and romantic. 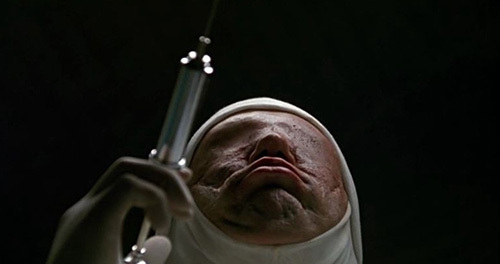 Adrian Lyne grounds the film through Robbins’ performance, then imbues it with suggestive lighting and unsettling imagery — bizarre glimpses of things not quite human, not quite bound by the laws of science. Some of Lyne’s stylistic inventions have become horror tropes still at play in the movies today. Elizabeth Pena deserves special mention for a difficult supporting role. She plays Robbins’ girlfriend… but more than that. (No spoilers.) If Jacob’s Ladder were a dessert, Danny Aiello would be the cherry on top. He plays Robbins’ protective and assuring chiropractor. It’s okay to think of him as a guardian angel, too. Some of the symbolism might be heavy handed, the score (by Maurice Jarre) a bit repetitive, and the ending could maybe stand further finessing, but Jacob’s Ladder is a beautifully moody masterwork. It’s moving and disturbing, and has a terrific final moment that makes you look back over the entire film with even deeper appreciation. With Matt Craven, Pruitt Taylor Vince, Jason Alexander, Eriq La Salle, Ving Rhames, and Macaulay Culkin.